Harry Bahrick, pictured at the Psychology Department’s 100th anniversary celebration Oct. 5, where President Rock Jones announced that Professor David Robbins, who died Sept. 30, had established an endowment in honor of his good friend and mentor. Dea DeWolff, wife of Robert Kail ’71, who gave an introduction for his former professor, applauds. 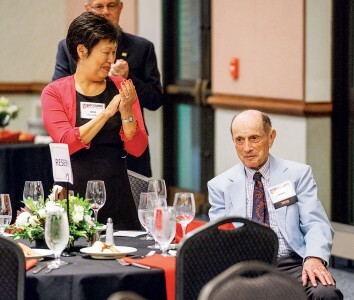 More than 100 former students and faculty members gathered on campus Oct. 5 to celebrate the Psychology Department’s 100th anniversary at Ohio Wesleyan and to honor two of its legends, who had more than 100 years of combined experience. Harry Bahrick joined the department in 1949 and retired in 2006, remaining an emeritus member of the faculty and co-authoring a 2013 book with psychology Professor Lynda Hall and former associate professor of psychology Melinda Baker summarizing more than 50 years of research on maintenance of knowledge. Bahrick established the Memory Lab during his illustrious tenure, funded by a succession of grants over 40 years. Most recently, he received the Association for Psychological Science’s Mentor Award, which recognizes psychology researchers and educators who have shaped the future direction of science by fostering the careers of students and colleagues. One of those colleagues was David O. Robbins, who joined the department in 1973 and specialized in neuroscience; the neuroscience program was named in his honor in 2011. Robbins died Sept. 30, leaving an indelible mark on his department and OWU following his many roles within the administration (see Robbins’ obituary). 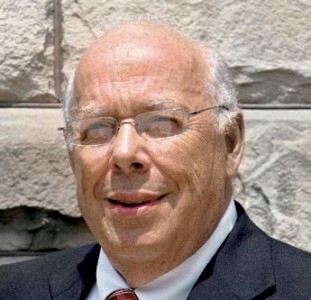 In a testament to that community, in June, Robbins quietly established the Harry P. Bahrick Honors Tutorial Endowment with a gift to the Connect Today, Create Tomorrow campaign to honor his dear friend in perpetuity. The endowment will enhance the honors tutorial programs and educational experiences of honors students with support for their research, internships, or travel to conferences. President Rock Jones announced Robbins’ gift, which was a surprise to most. Anyone can make a gift to the Harry P. Bahrick Honors Tutorial Endowment. Robbins’ family suggested those who wish to may make a gift in his memory to the David O. and Janice S. Robbins Summer Science Research Endowment. Visit owu.edu/give and click “other” or call 740-368-3315.